Following quite a few rumors suggesting that Google had some sort of TV/entertainment device up its sleeve, the Nexus Q – touted as a "social streaming media player", has now been officially announced at the big Google I/O event today. The Nexus Q is described as a device that can stream all of your content from Google Play – which includes an assortment of HD movies and TV shows – and YouTube, along with your own content to your living room screen and speakers. To elaborate on the latter point, the device also features a built-in 25W amp, allowing it to power a pair of bookshelf speakers. Alternatively, for you audiophiles or home automation junkies out there who may not find that satisfactory, you can integrate the Nexus Q with your existing A/V receiver and home entertainment setup. If a more expensive and custom audio solution isn’t something you’re considering, you will be able to purchase Google’s own proprietary Triad speakers for $399, which were designed to accompany the Nexus Q. From a more geeky standpoint, the Nexus Q packs support for Wi-Fi 802.11 b/g/n, Bluetooth, and NFC, along with a capacitive touch sensor. Under the hood, it runs Android 4.0 Ice Cream Sandwich, and packs 1GB of RAM and 16GB of local storage (you don’t need too much storage on this device considering that most of the content is fed to it from the cloud). To elaborate on what "social streaming" means, you can create what are referred to as social playlists with your friends who happen to own Android devices. All they have to do is connect their phones to your WiFi network, and you’ll be able to create and stream social playlists to your living room audio system using the Nexus Q. 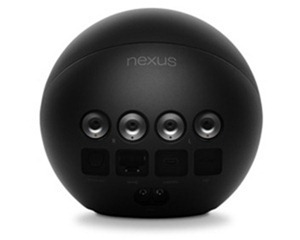 The Nexus Q is currently only available in the USA and is priced at $299, and the optional Triad speakers are priced at $399. The product listing on the Google Play store estimates ship time at 2-3 weeks as of today.